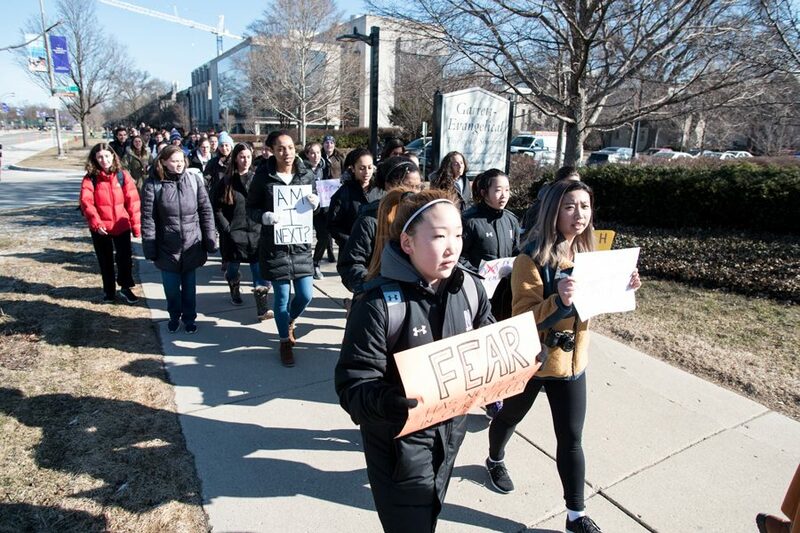 Northwestern students walk out on Sheridan Road on Wednesday, March 14. On the one-month anniversary of the shooting at Marjory Stoneman Douglas High School in Parkland, Florida, hundreds of Northwestern community members joined with thousands of other schools across the country Wednesday morning in a nationwide walkout to advocate for gun reform. The walkout began at 10 a.m. as students, faculty, administrators and others gathered outside the Technological Institute and at The Rock. The two groups then converged on Deering Meadow, chanting “NU stands with MSD” and “thoughts and prayers are not enough.” At Deering, there was a moment of silence at 10:17 a.m. for the 17 killed in Parkland on Feb. 14. After that, University President Morton Schapiro and Mayor Steve Hagerty addressed the crowd before several students described their connections with Parkland and hope for change. Weinberg freshman Maddie Gaines, a native of Parkland and said her best friend was at Marjory Stoneman Douglas during the shooting. Though her friend survived, Gaines said people should take action and “make my best friend’s school the last” to experience a shooting. Communication freshman Valen-Marie Santos, one of the organizers of the NU walkout, told The Daily that a group of students who were affected by the Parkland shooting came together to organize the event after noticing a lack of conversations about the topic on campus. “The first week after (the shooting) happened, I think a lot of us felt really alone in our feelings and didn’t really feel like this campus cared too much,” Santos, who is from South Florida, said. Since then, Santos said administrators have been supportive of the walkout movement. At Deering, Schapiro told the crowd this generation of college students is different from his: it is inclusive and will be able to make progress on gun control. He said there is a growing bipartisan recognition that gun violence is unacceptable. “Your generation is the one demanding that we finally do something about gun violence,” Schapiro said to the crowd. The student speakers at the event encouraged the crowd to engage in efforts to increase gun control. After the walkout, organizers invited students to send letters to their representatives in Congress, register to vote and sign a banner that would be sent to Marjory Stoneman Douglas High School. Santos said the organizers are hoping to have future events, including one on April 20 to remember the shooting at Columbine High School that happened nearly 19 years ago.